Many Christians share the assumption that preaching the word of God is at the heart of God's plans for the gospel in our age, that it is vital for the church's health, and that it is the central task of the pastor-teacher. Many helpful books on preaching are available. The vast majority are concerned with "how-to," but relatively few focus primarily on the character and theology of preaching according to Scripture. Two key, interrelated questions need to be addressed. First, is there such a thing as "preaching" that is mandated in the post-apostolic context—and, if there is, how is it defined and characterized? Second, how does post-apostolic "preaching" relate to the preaching of the Old Testament prophets and of Jesus and his apostles? In this New Studies in Biblical Theology volume Jonathan Griffiths seeks answers to these questions in the New Testament. In Part One he gives an overview of the theology of the Word of God, surveys Greek terms related to preaching, and looks at teaching concerning the scope and character of other word ministries in the life of the church. In Part Two his exegetical studies concentrate on teaching that relates especially to the post-apostolic context. In Part Three he summarizes the exegetical findings, sets them within the context of biblical theology, and proposes a number of broader theological implications. Griffiths's accessible, scholarly investigation will be of value to scholars, pastors, preachers, and Bible teachers. Addressing key issues in biblical theology, the works comprising New Studies in Biblical Theology are creative attempts to help Christians better understand their Bibles. The NSBT series is edited by D. A. Carson, aiming to simultaneously instruct and to edify, to interact with current scholarship, and to point the way ahead. "This volume addresses the need for a biblical theology of preaching by focusing on some foundational matters before closely studying a handful of passages in Paul and in Hebrews. Considering how much preaching is done week by week around the world, it is good to have a study that requires us to reflect on what we are doing." "Every volume in this series has been significant and worthy, and this volume follows in that same line. Preachers have found tremendous encouragement, and challenging observations, from Griffiths' unfolding of preaching throughout the New Testament. Preachers will also be encouraged by understanding the gravity and importance of preaching as Griffiths displays the preaching ministry of the Church as found in the New Testament." "I recommend this book. It does what it sets out to do. It convincingly shows that preaching is not simply something we do (and to which we listen) because it works or because it has been done for many centuries, but instead because we are commanded to preach the word (2 Tim 4:2, the motto of my alma mater) and to 'desire the pure milk of the word' (1 Pet 2:3)." "Preaching in the New Testament presents a compelling biblical case for what preaching is and does. The book will not necessarily help readers become better preachers, but it will make them more aware as preachers—which, in the end, may make them more effective." "As a pastor myself, I found this book extremely encouraging, and came away not only with a clearer grasp of what God intends to accomplish through my preaching, but with a renewed goal of doing what I can to see that my preaching fulfills those divine purposes." "What a great encouragement for maintaining the centrality of preaching in our worship! Tasting heaven as God speaks to us through his word; what a great thought! 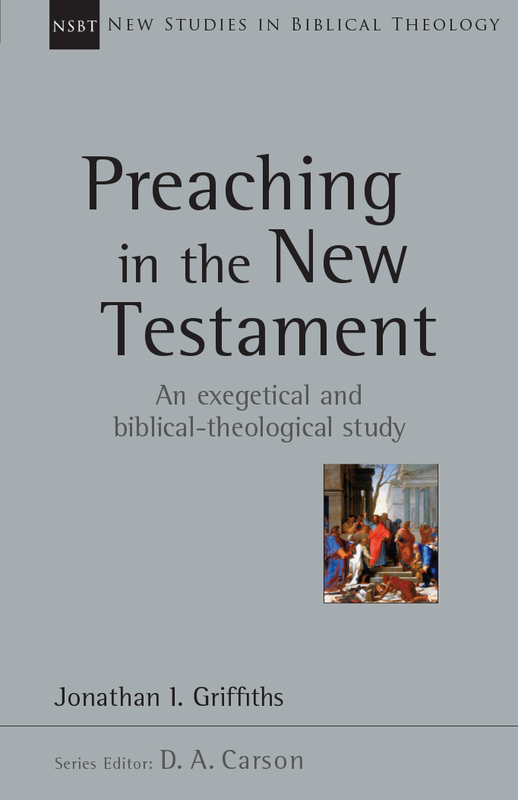 Preaching in the New Testament: An Exegetical and Biblical-Theological Study by Jonathan I. Griffiths is a great scholarly resource and encouragement to pastors in their regular work of exegesis and preaching ministry. Griffiths’ wok comes with the highest recommendations." 1. The word of God in biblical theology? 2. The language of 'preaching' in the New Testament? 5. Romans 10: The preacher's commission?